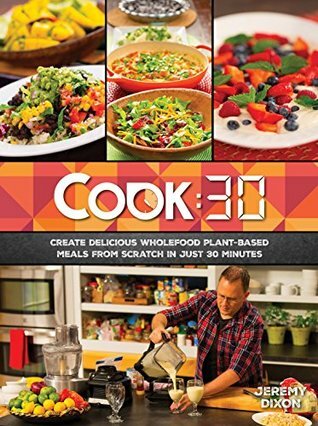 My first reaction when I began looking at this book was along the lines of… “It’s a vegan cookbook that goes with a TV programme I’ve never heard of.” Then I looked a bit further and did some research. Turns out that the writer is a New Zealander who used to work for Sanitarium (the Weetbix people) and then when on to run Revive Cafes in Auckland. He’s now doing a TV show for a US channel called 3ABN which represents the Seventh Day Adventist Church who, not coincidentally, own Sanitarium. They are religiously keen on a healthy lifestyle and were one of the first Western groups to advocate vegetarianism, long before New Ageism was the new thing. For what it’s worth, independent university studies of Adventists show their healthy lifestyle actually works in terms of decreased risk of a whole bunch of diseases and in increased longevity. So, there’s little doubt that cooking from this book would be good for you. Unless, of course, you happen to be allergic to soya or nuts, because both make frequent appearances. The book is notably well laid-out with 26 chapters, each corresponding to an episode of the TV show. Therein are recipes for a number of dishes to be prepared within thirty minutes, comprising a menu for one meal, usually dinner. Usefully, there is a timing schedule and a list of what you need to have organized at the beginning of the chapter. Temperatures are given in metric and imperial, volumes mostly in cups (given the relatively few recipes involving actual baking, this should not be a problem). In terms of content, the book tends to repeat itself, having at least three tofu curries, and a pear cashew cream that appears in two menus. That said, if you are going vegan, or require a gluten-free or dairy-free diet due to food intolerance, I think you would find this book uncommonly useful. I plan to share the chickpea pizza base with my gluten-free friend, and some of the dairy alternatives with the lady who is lactose intolerant. Still not sure how many of these recipes I’ll be trying myself, but you never know.